The Standing Stone: Clonenagh, Church, Cross Slabs and Holy Tree, Co. Laois. 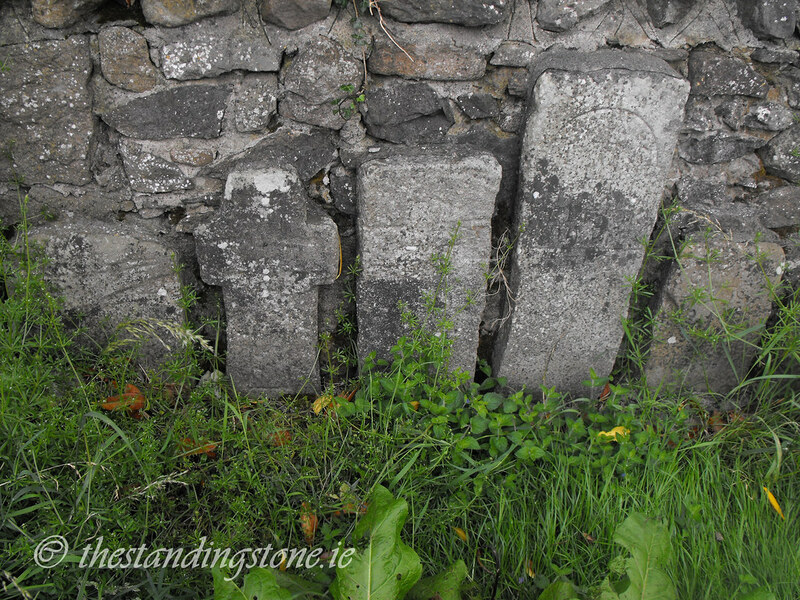 Clonenagh, Church, Cross Slabs and Holy Tree, Co. Laois. 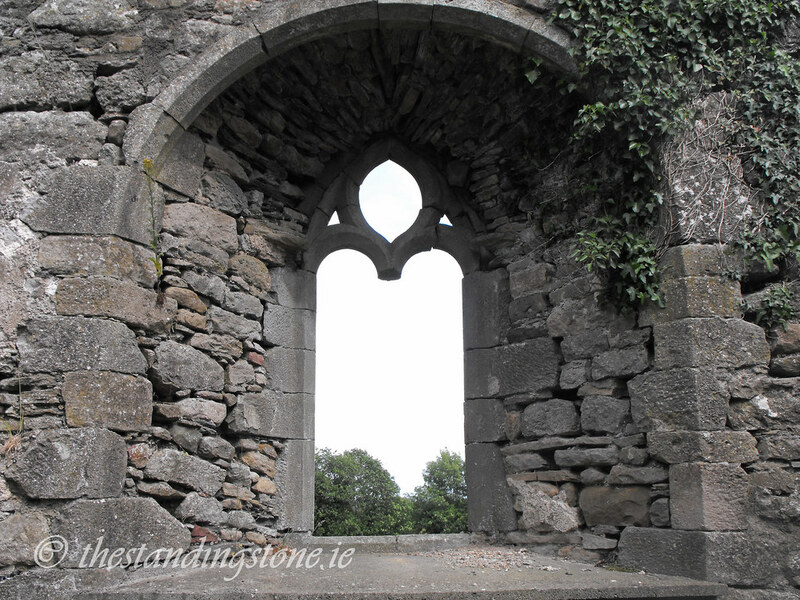 Location – On the N7 between Mountrath and Portlaoise. The church is located on one side of the road while the cross slabs are on the other along with the holy tree. Parking is easy here. The holy tree is in the lay-by near the cross slabs. 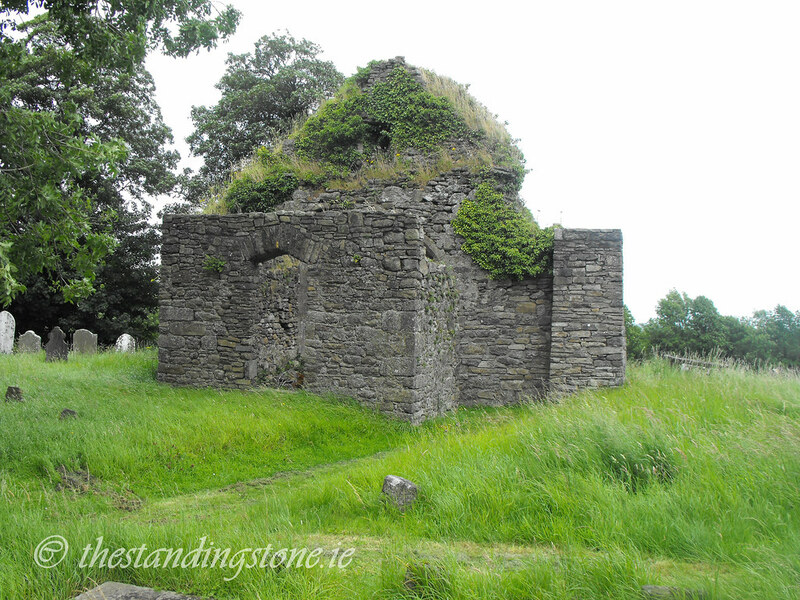 Description and History – Little remains now of this once important ecclesiastical site. Now divided by the N7 this is all part of the one complex allegedly founded in 548 by St. Fintan. Nothing remains of the original structure which was destroyed in 838 by the Vikings. 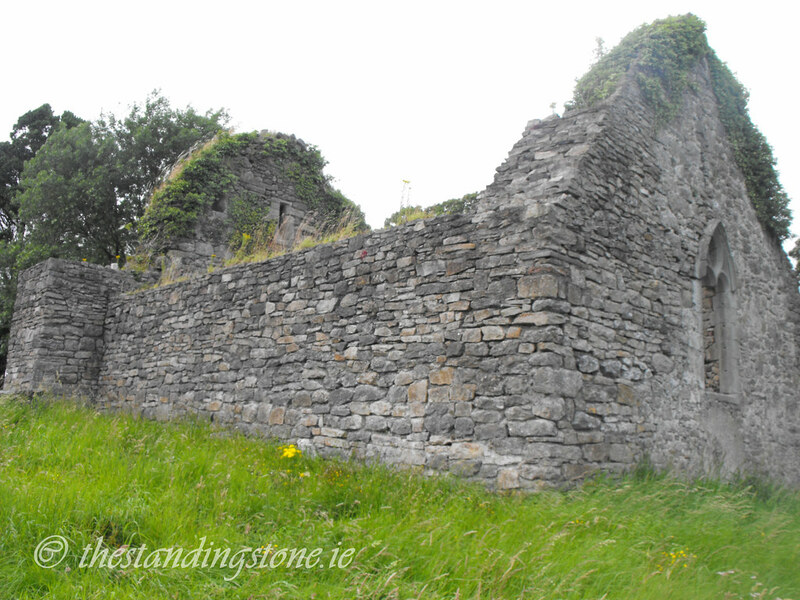 The site was plundered again in 937 by the King of Cashel and the Danes of Waterford. Legend says that 7 churches have been located at this site in its history with the remains of one still there and archaeological evidence for 2 others. 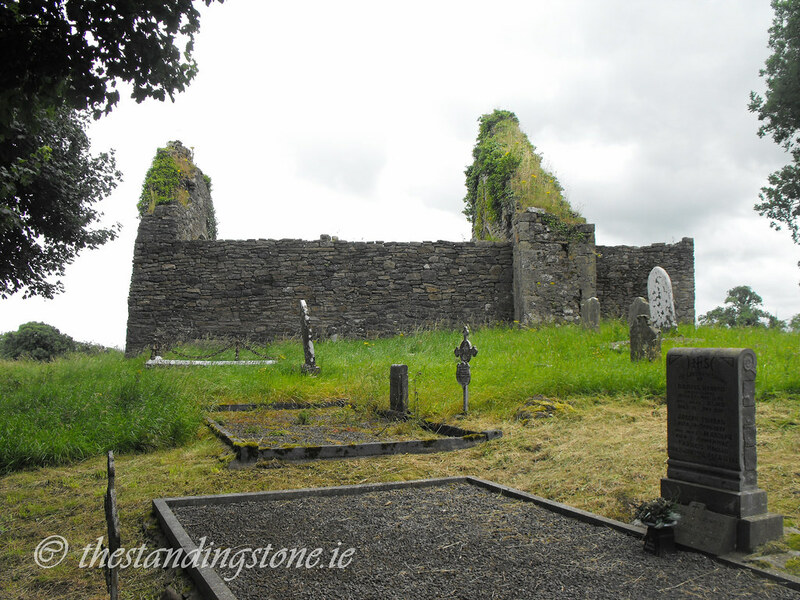 The present remains are of a 15th century church which was later used as a Protestant church and the graveyard is still used mainly by Protestants. A holy well, now destroyed, was associated with the site as is the holy tree located here. 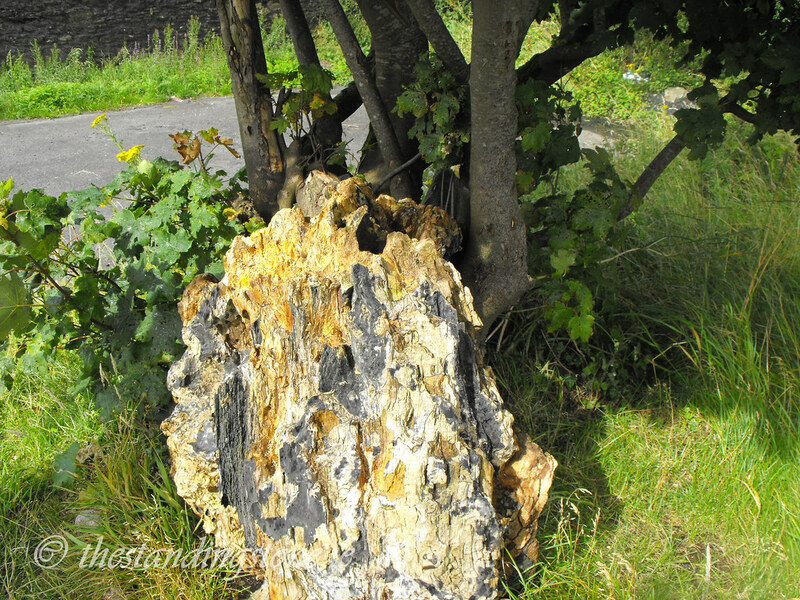 Before the tree collapsed some years ago, the water that collected in the trunk was thought to have healing properties. The tree collapsed due to severe metal poisoning. 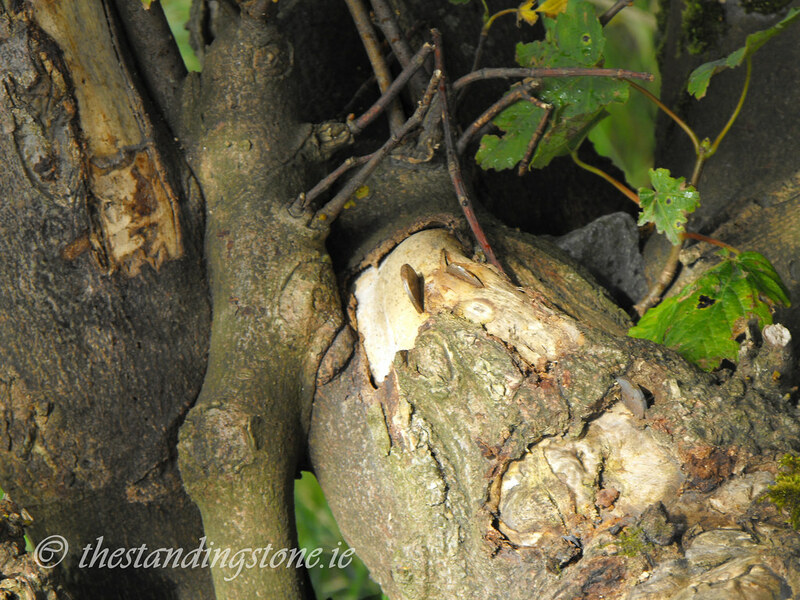 It was traditional to hammer coins into the tree as a votive offering. Fortunately new branches have started to grow from the remaining stump, but the coins still persist. I would advise that you don’t hammer coins into the tree and pull out any that you can. As you would expect of an important site there are many stories surrounding the complex. One interesting story is about a Protestant minister, Rev Sandys, who, after appearing drunk in the pulpit was expelled from the Church of Ireland. He, however, convinced his parishioners that he was still the serving minister and began to offer marriages at any time for the price of 1 pound. He didn’t even require witnesses in order to write out a marriage certificate. Eventually, nearby ministers made sure that Sandys was found out and he was sentenced to death which was reduced to a short term of imprisonment. He was forcibly removed from Clonenagh. As a form of revenge on the Church of Ireland he eventually became a Catholic priest. Two interesting stories involve St Fintan himself. One tale is that St Fintan would quarry the sand for the building of the church late at night from the Downs in Portlaoise. The local people wondered where he got the sand from and one man set to find out. One morning he saw Fintan returning from the Downs with his horse who he was guiding with a stripped holly branch. The man asked Fintan where he got the sand from. Fintan was so angered at this display of mistrust that he turned the horse into stone and threw the holly stick down which grew into a holly tree. 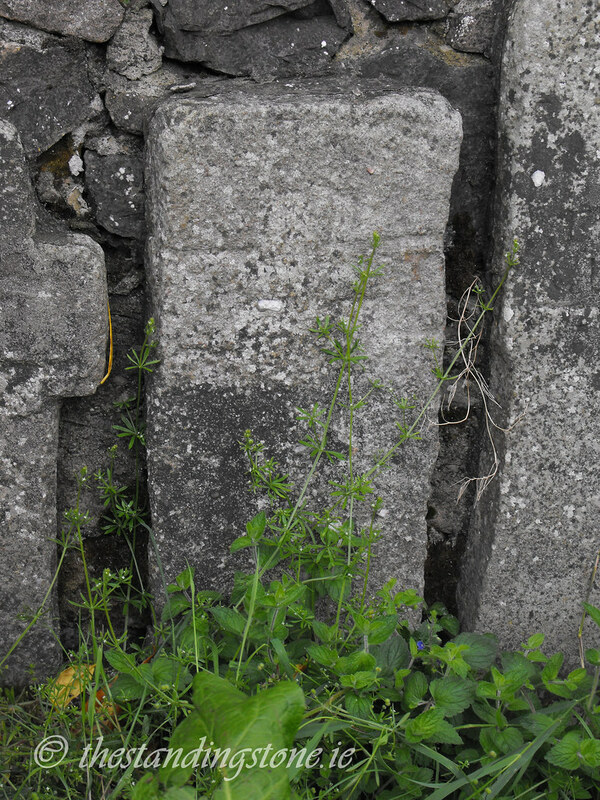 The location of this stone horse is rumoured to be between Clonenagh and Ballyfin but locals who know of its location will not divulge its location to others. The second tale is that one day Fintan was returning from the Downs once again with his cart full of sand and met a woman who was building a house. She asked for some sand but Fintan refused saying he needed it for his church. She asked if he would give a thimbleful to her and he agreed and when the thimble was full all the sand was gone. Church – Dating to the 16th century, little now remains of this sandstone and limestone building. It is roughly 9m in length and 6.5m wide. Around the arches there are some fine examples of hammer-dressed limestone. 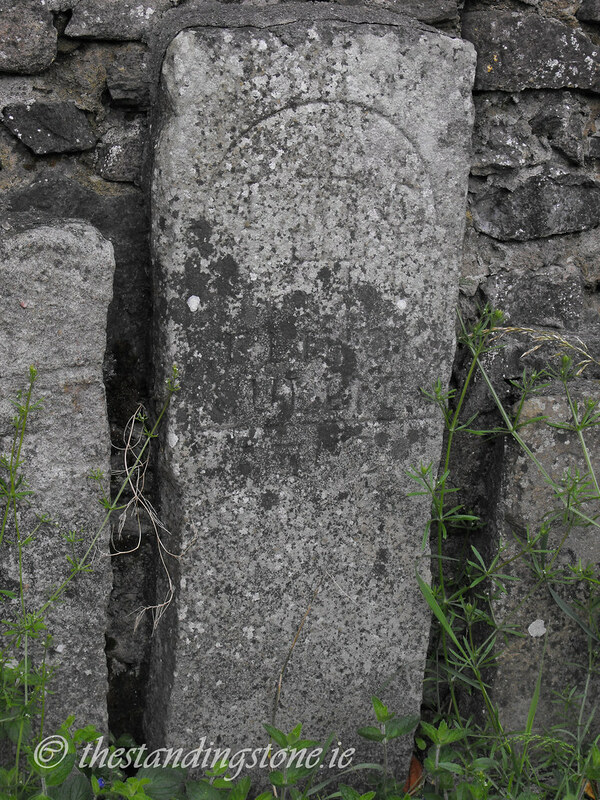 In the surrounding churchyard is a stone carved with a human face and another with a skull and crossbones. I was unable to locate these two stones. 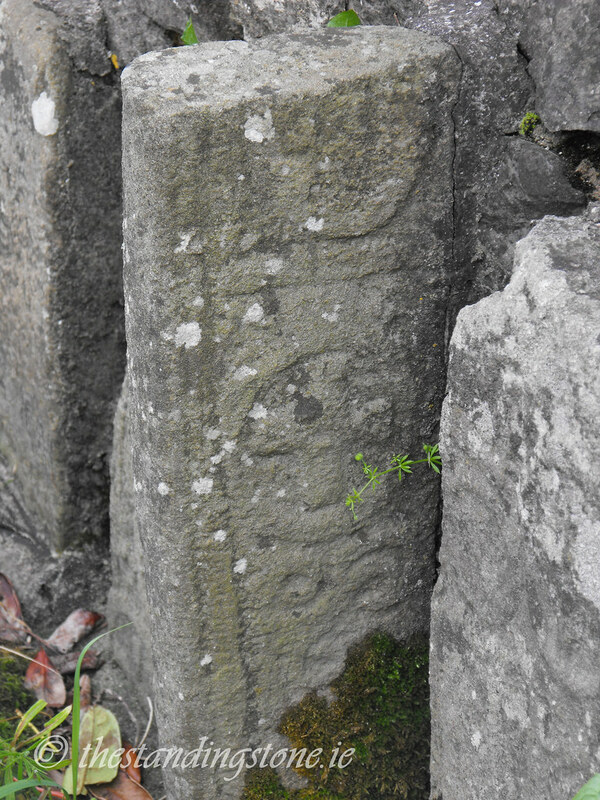 Cross Slabs – These recently discovered stones are a wonderful sight and give you a glimpse into the art of the early church in Ireland. 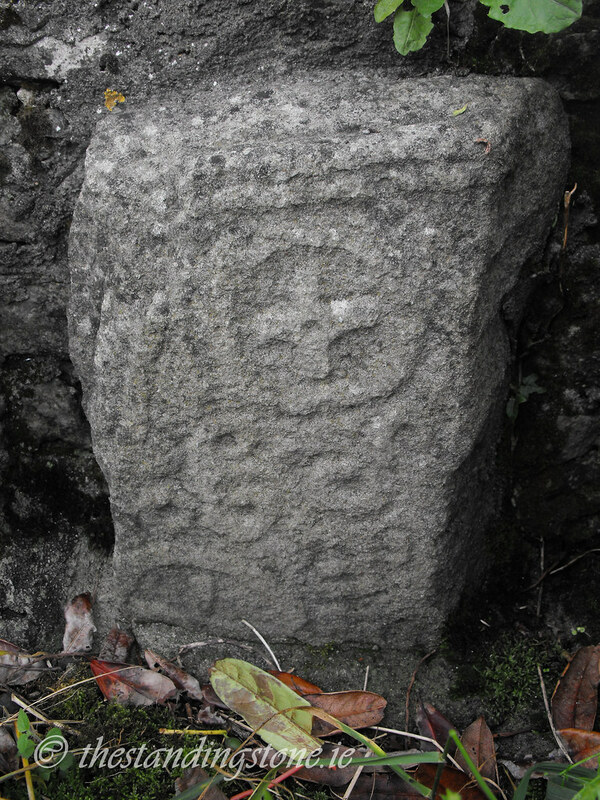 These stones date to the 6 and 7th centuries and have a variety of decoration on them. 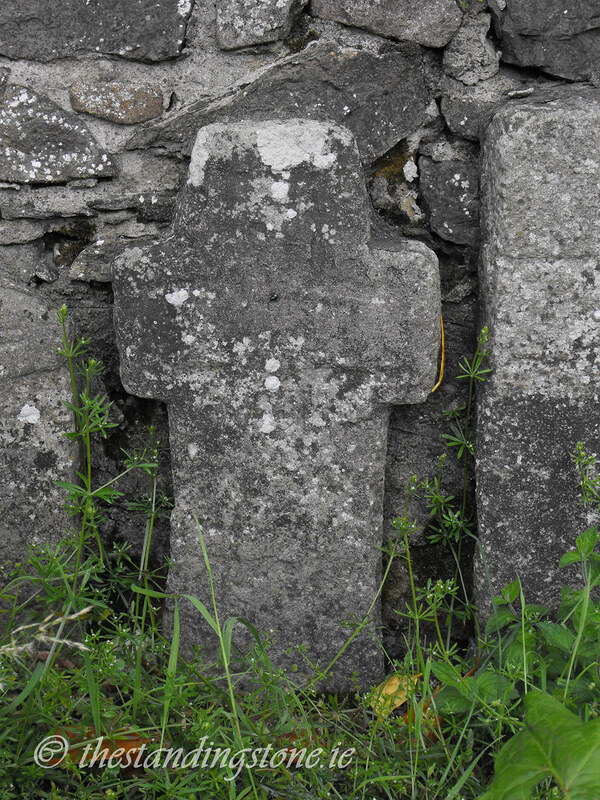 The standard cross within a circle design is visible on many stone as are some simplistic cross designs. On some stones there are some more modern designs carved onto the early stone and these designs date to the 17th century. 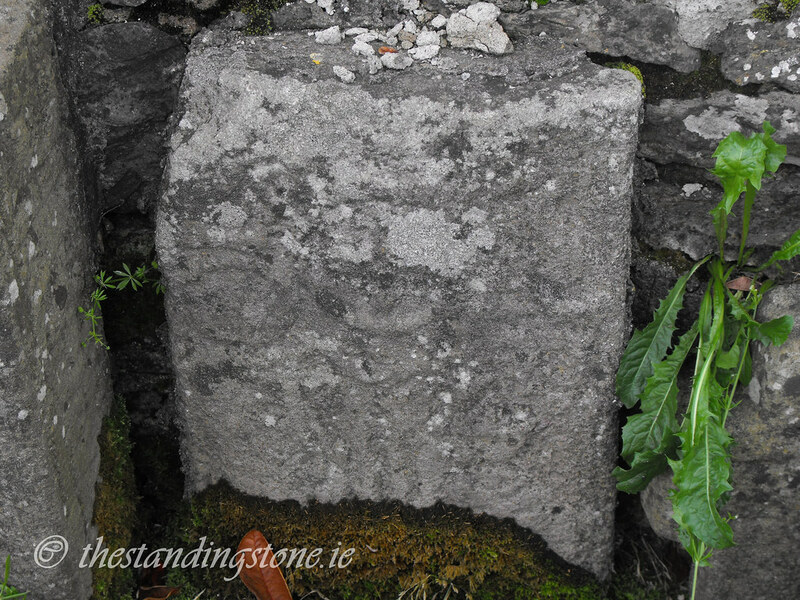 These stones are rare in Laois and are important for the county. However, there are fast eroding and when compared to photographs taken only 15 years ago the amount of erosion is shocking. As a matter of conservation they need to be removed to the safety of a museum. 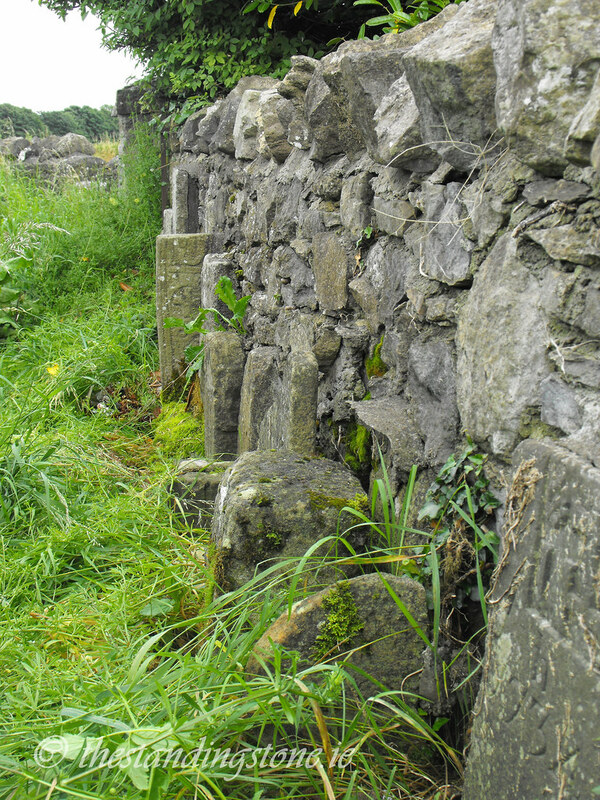 The graveyard in which they are kept is poorly maintained and the stones are surrounded with rubbish that had been thrown in by people stopping in the car park. These stones will not be around much longer unless conservation work is carried out. Difficulty – These two sites are easy to get to and are located directly on the N7. Be careful of the traffic as cars race around this area. 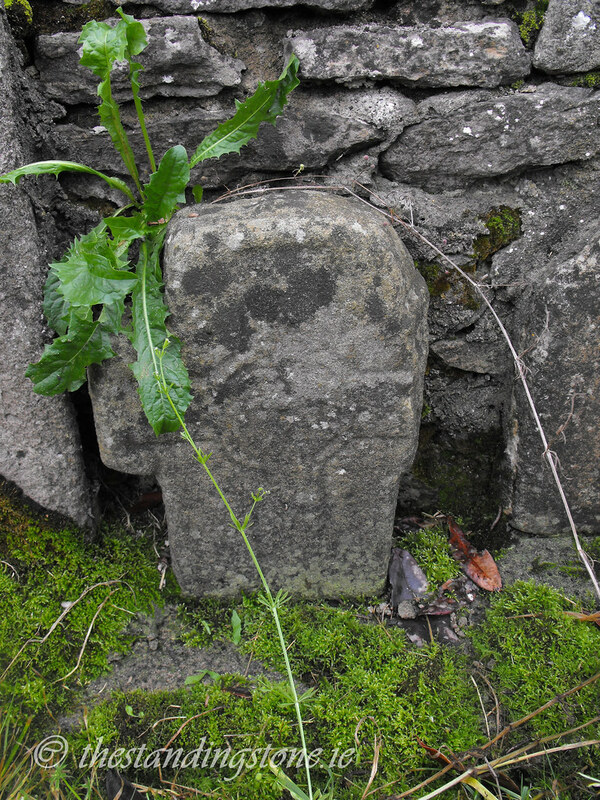 The graveyards are poorly maintained and there are many low grave markers that can be easily tripped upon. This is a lovely pointed window in the church. The holy tree...what's left of it anyway. Coins are being driven into the branches causing the tree to rot from copper poisoning.